Child found wandering near the zoo. UPDATE: At around 7 p.m. (2/13/17) a relative of the little girl contacted police and we are currently working to determine if her parents will face any charges. We would like to thank the community and media for helping to find her family. We will provide more information as it becomes available. PREVIOUS POST: Albuquerque Police need help identifying a little girl's family. 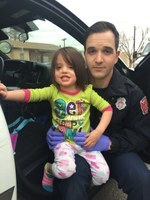 The child was found around 4 p.m. Monday, February 13, 2017, wandering around near the intersection of Stover and 8th Street. This location is just East of the City's Zoo. The little girl is about 3 years old. Officers canvassed the area in an attempt to find the child's parents. Now they are asking, if you know who her family is, please call (505) 242-COPS immediately.